One of the more disturbing criticisms of the housing affordability discussion is coming from some pretty obnoxious baby boomers. They are telling younger Canadians to “stop whining” and accusing them of “entitlement”. Talk about irony! The typical boomer was raised in a home where mom stayed home and dad worked an 8-hour day. Back then, the average Canadian family could afford a comfortable middle-class life in a single-family home with only one income and little household debt (less than 30% of GDP). Today families are weighed down by record-high household debt which is approaching 100% of GDP. When it came time for university, boomers graduated without the need for large student loans. Their parent’s generation picked-up the tab thanks to a top tax rate of 80%. Now, university students are being asked to finance their own education, so boomers can enjoy the lowest tax rates since the Great Depression. The situation is especially bad in BC, where the 2013 BMO Student Survey found students here graduating with almost $35,000 in student debt. When the boomers started working, they enjoyed good starting wages and generous retirement benefits — thanks to strong labour unions. As they moved up the income ladder and as some of them took over positions in government, they gave themselves huge tax cuts, greatly weakened the strength of labour unions, and put in place plenty of other perks that they disproportionately benefited from — like income splitting and TFSAs . In a report from earlier this year, the parliamentary budget officer concluded that TFSAs overwhelmingly benefit older, wealthier Canadians. Did I mention the TFSA was first proposed by one of Canada’s most prolific millennial-mocking boomers, Garth Turner? As the baby boomers stock holdings grew, corporate income tax rates fell. 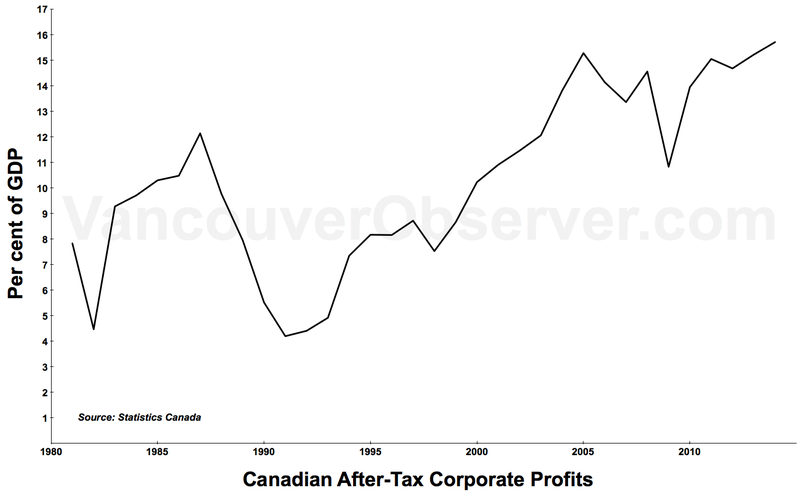 Since the 1980s, the Canadian corporate income tax rate has been cut in half. This has done wonders for after-tax profits, and been yet another windfall for the boomers. Ask any millennial if they expect to get the same generous government retirement benefits that older boomers now enjoy. The age for OAS is already going up. Sorry, you young entitled whiners, but there’s a good chance you’ll be working many years more than the boomers had to. When it comes to housing, boomers were able to buy a single-family home on one income. Then they got to enjoy decades of falling mortgage rates, giving them a nice bonus every time they renewed their mortgage. The outlook for millennials is much less rosy. As hard as it is now to buy a place, it’s likely to get much worse when they renew as interest rates have nowhere to go but up. One of the regional perks enjoyed by boomers has been the Agricultural Land Reserve. In the mid-1970s, after many of them bought cheap land for their homes, restrictions were put in place on future development. As a result, the ALR helped ensure that the homes of baby boomers would appreciate handsomely. We got ours, tough luck future generations! Now stop whining! And one of the most outrageous examples of boomer entitlement comes courtesy of the BC Liberals. For homeowners over the age of 55 — most of whom are equity rich — the BC government will now give you a super-low 1 per cent loan. The only requirement is that you don’t pay your property taxes. Meanwhile, the whiners get to pay over 5 per cent on their student loans. I don’t think there’s been a generation in history that’s had it as easy economically as the baby boomers. They’ve enjoyed economic tailwinds their entire life. Now that millennials are rightfully complaining that their prospects are much worse than baby boomers enjoyed, some of those boomers now have the audacity to call millennials entitled? So true, and the millennials were also told by their baby boomer parents, life would be sweet, they could be whatever they wanted to be and that they were all uniquely special… A bit disappointing for many reality at times.